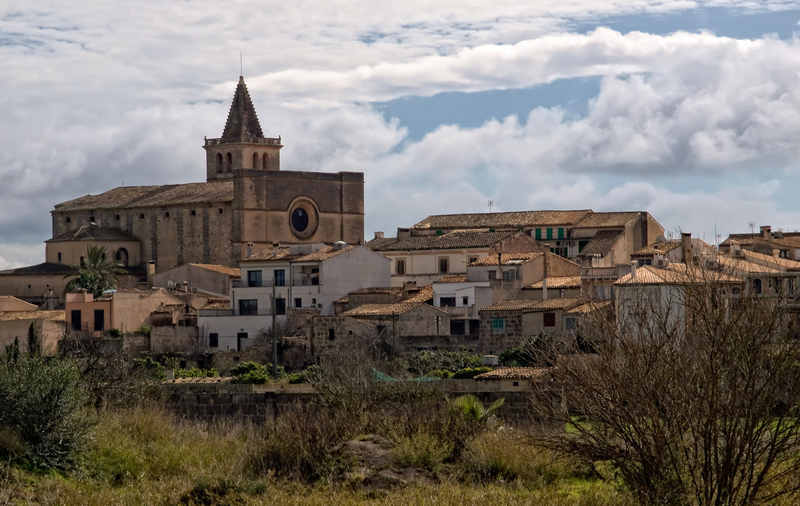 Porreres is a town and commune in the plain of Mallorca (Es Pla), a little more than 5200 inhabitants. Porreres is a mainly agricultural town, which traditionally produces cereals, almonds and wine. The town still has thirty-six windmills once used to grind grain, it is also the seat of the Council of the Denomination of Origin wines Plain of Levant, installed in the mill N’Amengual. In his map of Majorca 1784-1785, Cardinal Despuig reflects the winemaking tradition of Porreres by an illustration of the card, which also provides information on the cultivation of saffron, this Porreres at that time. More recently, Porreres gained a reputation in the production of apricots, because it produces the majority of dried apricots of Mallorca. 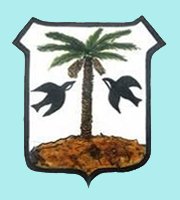 The crest of the city of Porreres watch - strangely - a date palm with two swallows (which are insectivorous birds) seem to want to eat dates. The name comes from Porreres surname of one of the knights who took part in the conquest of Majorca, Guillem de Porrera. In the distribution of land after the reconquest, Jaume I attributed lands southeast of Mallorca Sanç Nuno, Count of Cerdanya and Roussillon. In 1231, Nuno Sancho gave the alqueria of Alquazor and rafals (mansions) of Maffumet Totzeta and its vassal Guillem de Porrera. These lands adopted the name of the new lord and were named after the area of ​​Porreres. On the death of Nuno Sanç in 1241, his land returned to its closest relative, the King James himself. In 1300, the city was declared Porreres royal city by King Jaume II. The surname of Porreras itself comes from the name of the locality in which they were the lords of the town of Porrera in the County of Priorat (Province of Tarragona in Catalonia). Porreres is called Porreras in Castilian Spanish. The people of Porreres are named "porrerencs". 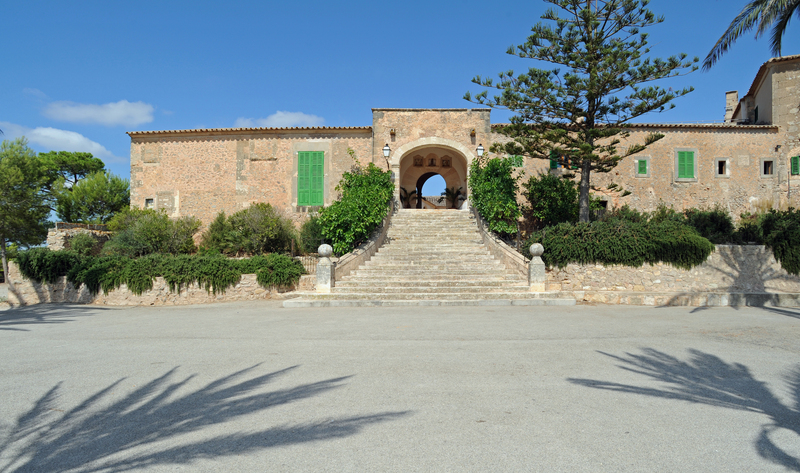 Porreres is located in the center-south of the island of Majorca, in the middle of the plain of Mallorca (Es Pla). Porreres is distant 40 km from the capital Palma, 18 km from Manacor, 14 km from Felanitx, Llucmajor 13 km and 11 km from Campos. 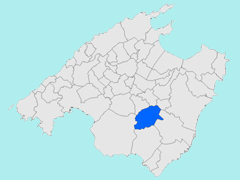 The town of Porreres is bordered by the municipality of Montuïri and Sant Joan in the north, of Vilafranca de Bonany northeast, Felanitx east, Campos south and Llucmajor southwest. The parish church of Our Lady of Consolation of Porreres is the most important building in the city, the building is 84 meters long, 17 meters wide and 25 meters high. 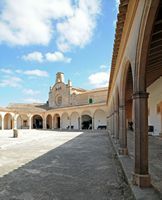 Its size and its artistic wealth the Església de Nostra Senyora de la Consolació de Porreres is considered the cathedral of rural Majorca. Due to the population growth of the city, the priest Gaspar Llompart Jurors and the city decided to build a new church, larger than the previous ones. The construction work was entrusted to the prime contractor and Oliver began in 1666, the nave was not completed until 1714, almost 50 years later. The frontispiece of the church consists of four numbers separated by cornices levels, the main entrance is a large gate lintel resting on Romanesque columns, above the lintel is an effigy of Our Lady of Consolation, the holder of the church. To the right of the portal stands leaning against the facade, a monument to Bishop Pere Joan Campins, who was rector of Porreres between 1887 and 1893, and who made ​​the restoration of the Sanctuary of Monti-sion. On the right side of the facade we see an old sundial dating from 1798. In the upper part of the frontispiece is a large opening skylight, without rosette. The campanile stands slightly away from the wall to the right of the church is a strong square tower seven floors separated by simple cornices. The last two stages have windows lancet (slightly ogival) on each side. The roof of the bell tower is surrounded by a railing to railing; coverage is shaped like a pyramid whose edges are decorated bleachers, giving the appearance of a crown. The interior of the church of Notre-Dame is a large nave, but only covered with a barrel vault. The vault is supported by arches resting on eight pillars that separate the seven side chapels on each side of the nave. 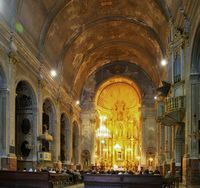 The choir is covered by a very slender elegant shell, behind the altar is a large altarpiece of the eighteenth century. This altarpiece is a work of Josep Sastre, dating from 1762, it has six Corinthian columns framing a large tent, with, on the sides, the effigies of the two patron saints of Porreres, John the Baptist and St. John the Evangelist. At the top level is in the middle of polychrome sculpture of Our Lady of Consolation, and on the sides, statues of St. Stephen and St. Francis. A painting of St. Peter appears in the upper part and a shield of the city overcomes all. We also note the pulpit, carved heraldic and biblical motifs, which is one of the few Gothic Chairs Mallorca kept until today. There are also twenty stalls, from the monastery of Saint Francis of Palma, made ​​from 1447 by Macia Bonafè. The Chapel of the Rosary is almost like a small church in the great church of Notre Dame: it has two chapels and a choir. The Rosary Chapel is covered with a rectangular dome decorated with paintings depicting the mysteries of the Rosary. The altarpiece of the choir is also Josep Sastre, such as the altar, representing the image of the Virgin of the Rosary. Next to the Chapel of the Rosary, is the lateral portal, which is topped by an organ work of Lluís Navarro the mid-eighteenth century. This organ has been restored several times, most recently in 1982. 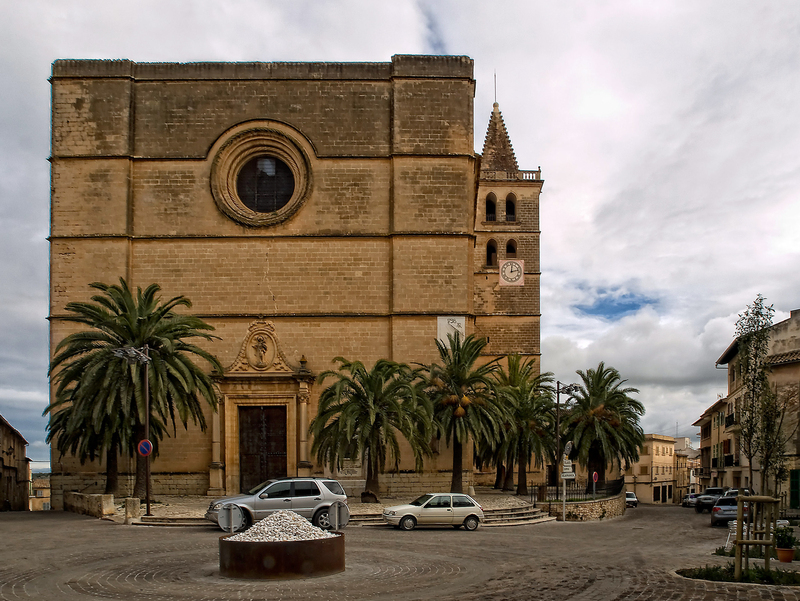 The parish church has a sacred Porreres of great artistic value object: a silver processional cross of the fifteenth century, which is considered the most beautiful piece of gothic jewelery made ​​in Mallorca, it is the work of goldsmith Antoni Oliva (1400). This monumental cross is partially gilt on wood core, the metal is embossed and chased with rich decorations translucent enamel. The Treasury also has a tabernacle of silver, decorated with enamel, the late fourteenth century and a Gothic reliquary, gilded silver, containing a piece of the True Cross (Lignum Crucis). The Sanctuary of Monti-sion is the mystical place in the region of Porreres the population of the city went there in procession during the celebration of Diumenge de l’Angel, the first Sunday after Easter. Go to the shrine of Monti-sion. Under the Moorish occupation, Porreres part of the central juz Manaqur, which also included Manacor and Felanitx and parts of the towns of Campos and Santanyí. Some public wells of the town - still state - evidence of the Moorish presence in Porreres. The finca Son Mercadal is a rural hotel set in a mansion tastefully restored nineteenth century. This agro-tourism hotel, yet charming in the middle of a large estate of seven hectares populated almond, carob and oak trees, with pool and garden. Eight rooms with period furniture. Traditional Majorcan cuisine restaurant with terrace. From 105 €.